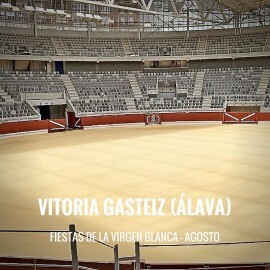 Vitoria, the capital of the province of Álava, has not held a bullfighting fair since 2016. 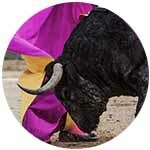 The change of government brought with it the elimination of subsidies for bullfighting and the requirements presented by the town halll to manage it in 2017 and 2018 are unaffordable for companies, having stayed deserted both years. Hopefully a city with a bullfighting tradition as long and important as Vitoria regains the celebration and fair it deserves. The 'Virgen de la Blanca' (White Virgin) is the patroness of Vitoria and, since 1884, the people of Vitoria celebrate their big festivities coinciding with her day. They begin on August 4 with the 'chupinazo' (rocket) in the Plaza de la Virgen Blanca and the bell ringing of San Miguel; moment of the descent of the 'Celedón', symbol of the city that represents a villager from Álava. His return the morning of 10, between fireworks, marks the end of the holidays. The crews of blouses are the main protagonists of the festivities of Vitoria, groups from Vitoria dressed in the typical costumes that are responsible for organizing and participating in most activities. Every day has something special: on August 7 is the 'Celedón Txiki', recreating the descent with children as protagonists; 8 is the day of 'Veteran Blouse' and we can see the older ones with blouses of crews of the 60s; and 9 is the 'Day of the Piggy'. The bustle fills the city during those days: 'charangas' (street music groupings), parades, children's workshops, festivals, concerts of all kinds, attractions, barracks ... And also more traditional events such as the Procession of the Lanterns on day 4, which has been held since 1895, the Rosary of the Aurora on the 5th or traditional Basque sports competitions. 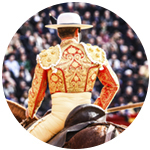 The Bullfighting Fair of Vitoria is celebrated in honor of the Virgen de la Blanca, around August 5. In the absence of major festivities, morning heifers have been organized with notable public success. 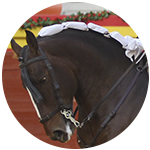 Address of Iradier Arena: Plaza del Renacimiento 6, 01004- Vitoria-Gasteiz. In 2016 the last Fair was held and Miguel Ángel Perera was the last winner, cutting two ears each of his lot from bulls of Valdefresno and Fraile Mazas. 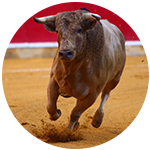 We regret to inform you that, currently, Servitoro does not have tickets for this show, but we recommend other bullfighting experiences a few kilometers from Vitoria. Servitoro, bullfighting news Algodonales Bullring, Cádiz.